1920's vintage crocheted gloves with fancy gauntlet. Black with moss green cotton and miniature pink pompoms. Open work black crochet with three green decorative points back. 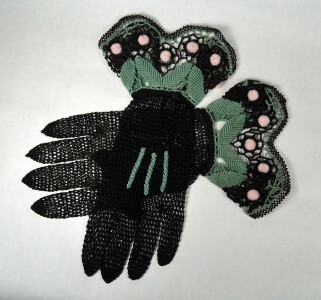 Fancy flared gauntlet with green leaf at base, green & black scallop edge and scattered pink chenille pompoms (9 each). Self button closure at wrist seam. All original twenties' vintage fancy gloves. A striking accessory and an outstanding addition to a party ensemble! Length from gauntlet edge to finger tip - 11 1/2"
Length from wrist seam to finger tip – 8 1/2"
Width measured across palm - 3 1/2"